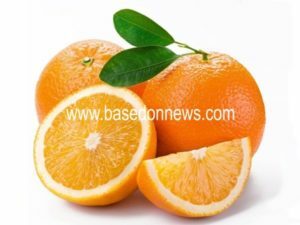 NUTRITIONAL BENEFITS OF ORANGE – One may ask why orange is been singled out among other varieties of fruits. It is because of its nutritional value. It is a fruit that is very special and good in every human’s body. Orange contains vital nutrients that help our body from the eyes to the bones such as: flavonoids, lycopene, zeaxanthin, potassium, vitamin C and beta-carotene, which is vitamin A. There are lots of orange and yellow fruits which include; oranges, lemons, ugli fruit, bananas, mangoes, pineapple, papaya, grapefruit, star fruit, apricots etc. but in all orange has the most vital nutrients. In popularity, orange is the most popular and common citrus fruits, as it accounts for 70% of the world’s citrus production. Its great taste makes everyone to take it as their major snacks. Using of hands to squeeze it: Hold the orange firmly and squeeze forcefully with your palm to make it soft. After that, remove the seeds after slicing it, then squeeze it again and use plain juicer to extract the orange juice. By use of Electric Juicer: Peel the oranges and cut it to quarters, then place in the juice. To get the juice, process it through the feed tube. There are other ways one can prepare orange juice, but the one’s listed above are highly distinguished from the rest. Maintenance of healthy eye: Orange helps in maintaining good and healthy eye as it contains vitamins A. Many people have eye problems today because they abuse this vital fruit, orange. The contents in this citrus fruit such as flavonoid, cryptoxanthin, lutein helps to maintain a healthy eye and to prevent macular deterioration. Source of control to blood pressure: Orange contains potassium which helps to control blood pressure by offsetting all sodium actions in the body. Agents to cancer prevention: The presence of vitamin A in orange helps a lot in preventing cancer. As we all know, cancer is one of the most dangerous diseases, and its treatment is very rare. So, it is very important for you to eat more of orange as to avoid the dangers of cancer. To know more about cancer, especially a very deadly and silent killer blood cancer, Leukaemia, Click Here. Strategy to prevent kidney disease: Most of us that eat orange do not know the nutritional value it has contributed to us. Come to think of it, kidney disease that has sent most persons to an early grave, is been removed in your body through the vital citrus, orange. Frequent consumption of orange juice helps to escape from kidney disease. Part of treatment to Diabetics: Orange is very important to diabetic patients as it helps in reduction of high percentage of blood sugar level as it contains low percentage of sugar. Stronger immunity: Orange contains high rate of vitamin C. As immunity is needed in our body to fight against diseases or foreign bodies, high consumption of orange helps to contribute to the immune system to fight against the foreign bodies and to be free from viral diseases. Stomach ulcer preventive agent: Ulcer has been a sickness that affects lots of people; it has made many restless and restricted them from eating most of their favourites. Orange, a vital citrus, keeps the stomach and intestines in good health as to avoid ulcer. Folate provider to pregnancy: High consumption of orange by pregnant women helps in the production of folate or folic acid for brain development and keeps the vital organs of the baby healthy. What a free nutrient to an unborn child through a natural citrus. Supports in sperm quality: Many complain of infertility and other sexual related diseases, some has wasted lots of money on purchase of drugs while the solution is always there with them. So common it is, but people neglect it. Orange contains antioxidants and vitamin C which enhances the quality of sperm and supports in maintenance of fertility. Reduces weight: Complains of too much fat and weight will stop. Anyway we caused it, by neglecting orange. We forgot that orange contains pectin – a large amount of dietary fiber. It also contain nutrients like niacin, thiamine, vitamin B6, magnesium and copper which helps in reducing weight and making the body more flexible. Formation of collagen: Orange contains vitamin C which contributes greatly in the formation of collagen for the formation of bones, ligaments, tendons and blood vessels. As orange prevents scurvy – a bruising, gum bleeding, tooth loss etc, it is highly recommended that you take orange always. Hair loss preventing agent: The production of collagen by vitamin C produced by orange prevents the separation of hair tissues. The folic acid in orange prevents hair loss, hence bringing forth a better hair. A better hair conditioner: This is a very nice way to save money. Try this, mix exact quantities of orange juice and water with a spoon of honey. Apply it on your you have shampooed already, then allow it to stay for 5 to 10 minutes before washing off. The hair will become more hydrated, glittering and more beautiful. Try this, is a free lesson to you from us. Treats dandruff: Orange juice is very strong for treating and controlling dandruff no matter how many months it has stayed. The pulp of the orange peel cleanses all sorts of scalp and dandruff. Prevents looking old: Some persons are very young but looks old, some said is natural, some have been abused and many have lost what they are supposed to get because of it. Orange is a very vital nutrient to solve this problem, as it contains vitamin C, a key component of alpha hydroxyl acid group that reduces wrinkles and makes the skin soft. Have you thought of this, why orange is been used in chemical products to remove dead cells and for younger skins. It is because it hydrates the skin and reduces wrinkles for younger appearance. There are lots more, but these few are written to encourage you the more, to consume more of oranges. Other nutritious fruits would be discussed so that you will know what to eat and what not to eat. Remember, “Health is wealth”. Keep subscribing to us using your email address and do well to Like our Facebook page and share to your friends for the benefits attached to it.